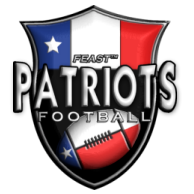 The FEAST Patriots of San Antonio, TX have captured the 2013 Division Two National Homeschool Football Championship, according to the tabulations of the National Homeschool Football Championship Series. The rankings record of 10-3 record of the 2013 varsity squad has earned a 52.7 power rating by the Freeman Scoring services of MaxPreps.com. 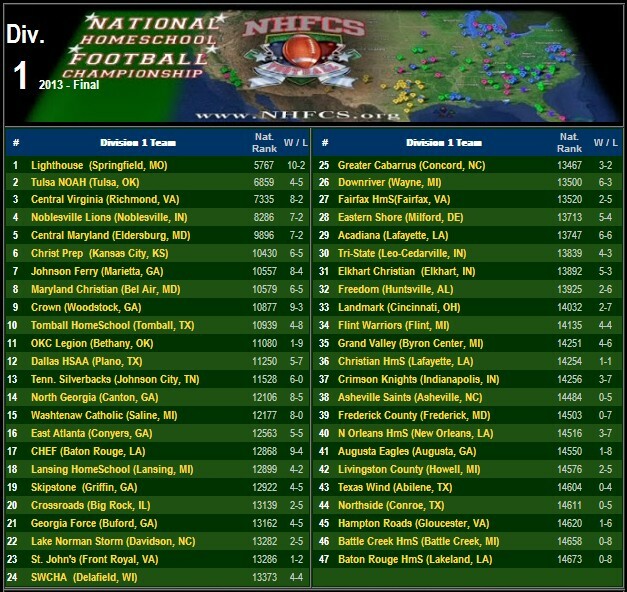 The rating placed the Patriots at #79 among over 1500 varsity prep teams throughout the nation. In contrast, the next best rating is a 47.9, by the second place team, Evangel Christian, who amassed a national prep ranking of #104. The Patriots benefited from a postseason tournament performance at the T-CAL Texas State Championships, winning an upset victory over the 30th best ranked team in the nation; which gave them a championship match in the Cotton Bowl, on Nov. 30th. FEAST soundly defeated the #7 & #8 homeschool teams in head-to-head action. Texas homeschool varsity teams enjoy a unique arrangement with many christian schools throughout the state. The multisport league has a contingent of more than two dozen homeschool members, along with several private schools and even one public charter school. The top teams were somewhat spread, but when the list gets to the 7th through 13th spots, the teams had power ratings within fractions of each other. This year's rankings included the largest membership group ever. So many developments became apparent during the 2013 season, including more than a dozen new teams joining the ranks. Better communications, standards of eligibility, accountability, and postseason planning; are all hallmarks of the 2013 football season. The issue of accountability will be further discussed in the weeks to come, on this website. Watch for it. A new league joined us in California. Texas & the Southeastern states added several teams. The Ohio Valley will see further growth in Kentucky and stretching down through Tennessee. The Lighthouse Christian Chargers of Springfield, Mo. 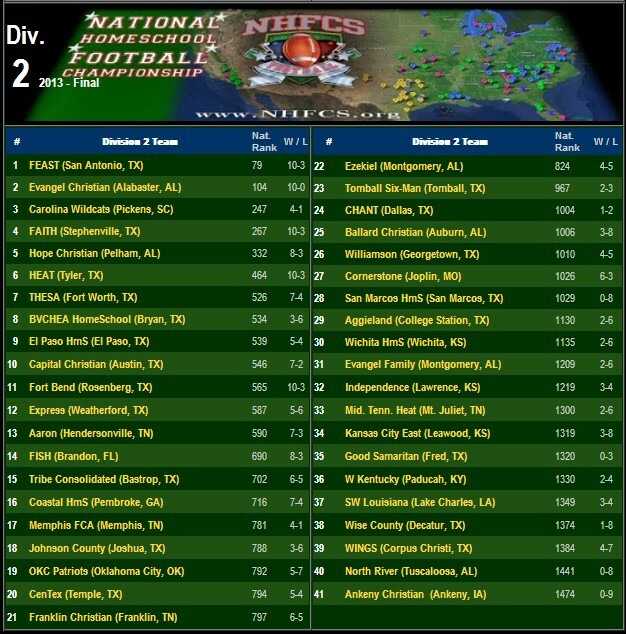 are the 2013 Division One Homeschool National Champions, according to the tabulations of the National Homeschool Football Championship Series. The rankings record of 10-2 record of the 2013 varsity squad has earned a 9.0 power rating by the Freeman Scoring services of MaxPreps.com. The rating placed the Chargers at #5767 among over 15,000 varsity prep teams throughout the nation. In contrast, the next best rating is a 4.5, by the second place team, Tulsa NOAH, who amassed a national prep ranking of #6859. The Chargers benefited from a postseason tournament performance at the NHFT, winning the top bracket in Panama City Beach, FL; on Nov. 23rd. Lighthouse defeated the #2 team (Tulsa NOAH Jaguars) in week One of the regular season; & #3 (CVCHA Disciples) in their final game of the postseason. Their 2 defeats came on the road, to very highly ranked football powerhouses. The Springfield, MO football organization has their roots going back to 2005. Head Coach, David Staley has been leading the team since 2010. Founding coach David Lohn led the team prior to that. This year's rankings included the largest membership group ever. So many developments became apparent during the 2013 season, including more than a dozen new teams joining the ranks. Better communications, standards of eligibility, accountability, and postseason planning; are all hallmarks of the 2013 football season. A new league joined us in the Appalachian states. Texas went from one 11-man team to four. The Great Lakes Region added more teams and the Ohio Valley will see further growth including three St. Louis area teams planning for the 2014 season.